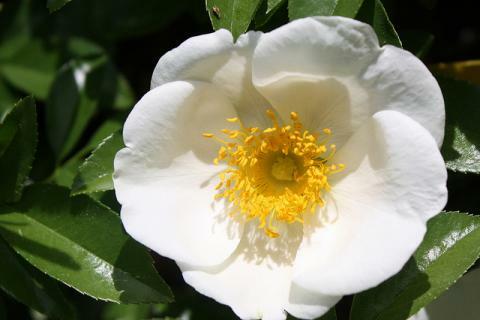 For those who did not know – the Georgia state flower is Cherokee Rose. Roses are pretty much everywhere where I am in Northern Georgia. Today on our motorcycle bike ride, we took our journey from 575 to 20 to 369 to 19 to 53 and then back to 575 to get back home. I have to tell you that 53 was the best part of the entire ride. I also thought the entire route was fantastic overall. What makes a great bike ride – a very scenic route for the most part with very little traffic. We like going through small towns. This time we went through a few small towns – a couple of interesting ones that I commented to my husband that I wanted to go back to make a few stops. In Dawsonville – there were a couple cute antique shops that appeared be worthy of a visit. Then I spotted a Folk Art Gallery in Dawsonville – Around Back at Rocky’s Place. When we rode by, you can see various whimsical and funky art outside. Dawsonville also has the Northern Georgia Outlet Mall. The other interesting town we rode through was Tate. It appears that Tate is known for marble manufacturing. Their middle school is built entirely in Marble. There is also Tate House. It is a registered Historic place, built by Colonel Sam Tate, and it is now a popular wedding venue. By the way, it is a PINK MARBLE MANSION. The total ride took about two hours. For me, it wasn’t quite long enough, but it will do for today. It was absolutely lovely to see the fall colors in the mountains and among the trees. Since we are near the “smoky mountains” – we can see the blue haze” among the mountains. The sun is out and shining. It is just a beautiful blessed day. Tomorrow is daylight savings time. Don’t forget to turn the clocks back this evening.